It may seem odd that laser swords, spaceships, and Death Stars made the cut off (along with The Sound of Musicopens a new window, The Princess Brideopens a new window, and Disney movies), but they did, and watching the original trilogy became a regular Sunday activity. The fourth, fifth, and sixth Gospels. We were in deep. Action figures, video games, and LEGOs (this was before LEGO Star Wars video gamesopens a new window or we would’ve had those too) all proudly Star Wars themed were an integral part of my childhood, teenage years, and—who am I kidding?—adulthood. For my 28th birthday I bought myself a Lego Star Wars set. An expensive one. I spent my birthday sitting on the ground in our living room watching the Clone Warsopens a new window as I built it. For my 30th I bought a even more expensive The Last Jedi poster signed by Mark Hamill. You only live once, right? All this started in 1977, when visions of a galaxy far far away completely mesmerized my 13 year old dad. The movie that later became known as Star Wars Episode IV: A New Hope was like nothing he’d ever seen. As one of ten kids getting by on my grandpa’s teacher’s salary, it wasn’t often that my dad got to go to the theater, but he was industrious. Scrimping and saving he managed to see Star Wars a couple of times in theaters thanks to his paper route earnings. Some of his friends saw it well over a dozen times and had every line memorized. They’d reenact the entire movie by heart. They’d talk about it in their radio club at school. No wonder I ended up so nerdy. One of my more recent Star Wars experiences was something with which my dad was already well acquainted, the Star Wars radio dramaopens a new window. I didn’t know it existed until my dad offhandedly mentioned listening to “the Star Wars tapes” back in the 80s. 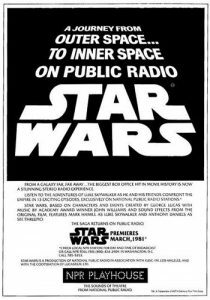 In 1981, George Lucas “sold” the rights to produce a radio serial version of Star Wars to KUSC-FM, UCS’s public radio station, for a dollar. Looking at it objectively, the idea seems a little preposterous; a large part of Star Wars’ appeal, especially when it first came out, is the sight of it—special effects, iconic spaceships, strange creatures, and foreign planets—it really does transport you to a long time ago, in a galaxy far far away. The radio drama is broken up into thirteen roughly thirty minute episodes and clocks in at just under 6 hours as a whole. That’s a lot of radio drama for a two hour movie. But it works. Brian Daley, who adapted the original screenplay, really wanted to add characterization, including some additional backstory, to the cast. I particularly appreciate that Luke and Leia are both allowed to briefly grieve their respective losses (Uncle Owen, Aunt Beru, and the entire planet of Alderaan) in the radio drama. Ben Kenobi’s sacrifice gets some well deserved extra attention too. There are little additions like that, but there are also all new scenes. Obi Wan gets in a little more training with Luke. Han Solo shows more of his rascally side. Darth Vader’s cruelty is explored more thoroughly. There’s an entire episode dedicated to Leia’s backstory. You also get to finally meet Luke’s friends at Toshi Station, and spoilers: they’re not great. Add all that new material, compelling performances, and great production value and you have a hit. 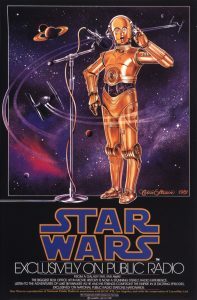 When the Star Wars Radio Drama first aired it broke NPR records with over 750,000 listeners. One of them was my dad. I asked him how many times he relistened to the tapes once he got a hold of them. Ten thousand was his rough estimate. And why not? It’s not perfect, but the Star Wars Radio Drama adds a new depth into a classic story that so many of us have come to love. And most importantly, it’s a lot of fun. 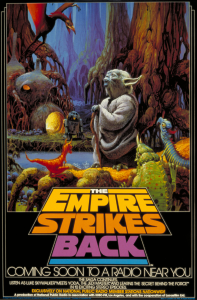 And luckily for us, we don’t have to wait years between episodes; the library’s copy comes with dramatizations of both The Empire Strikes Backopens a new window and Return of the Jediopens a new window. So get listening! Oh yeah, and may the Force be with you. —Ian Stepp is an Information Services Assistant at Lawrence Public Library.